Before we get into this week's challenge, we just want to thank everyone who joined our 3rd birthday celebration and blog hop. We had such fun visiting everyone and seeing your wonderful creations! Prizes will be awarded a little later, as it will take some time to sort out if everyone who entered a card also did the blog hop, etc. Can't wait to post who won my blog candy and get it off to you. Good luck everyone. Please send me your full name and mailing address exactly as it should appear on the mailing label (rsdrees@verizon.net) and I will get your embellishments and stamp off to you right away. Congratulations Carmen! There is so much glitter on this card, but it is so hard to photograph. You can click on the picture to enlarge if you want to see the glittery goodness!! 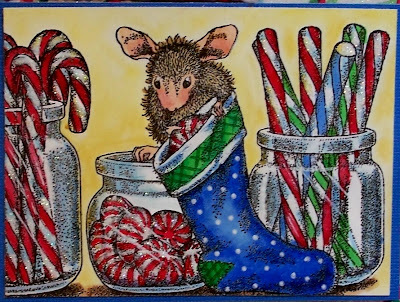 Amanda is filling her stocking with sweets! Please check out the beautiful sparkly cards on the House Mouse and Friends Monday Challenge Blog by our fabulous gals on the design team, you won't be disappointed! Hope you have a chance to join us for our Christmas Sparkle challenge. It is cute! very bright and great colouring! Love this card! Love your card. Looks so yummi! So great sparkle details. Cute image, lovely paper and great matching embellishments. what a fabulous image and beautiful colored sue. I just love your bright cheery card. Those candy canes look delicious enough to eat. Love all the wonderful sparkle! OH sue gorgeous sweet card!!! Hi Sue, your card is stunning, your colours are fantastic and enhanced so much by the fantastic colours, sparkling and papers. 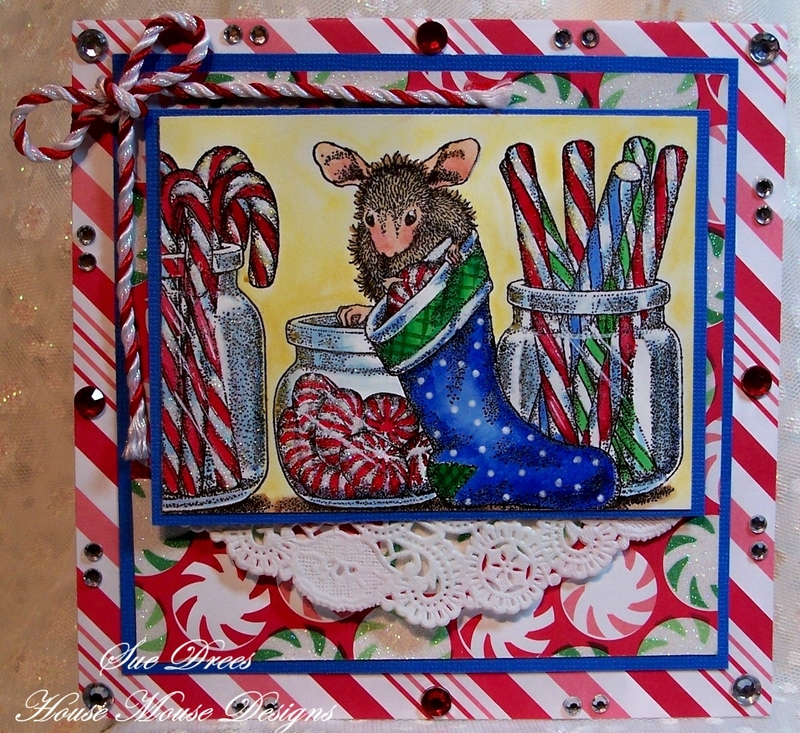 Ohhhh Sue the image are colouring are stunning amazing detail & love the bright colours great take on the sparkle..
Gorgeous Christmas creation Sue, I love your image and design. This creation is a real show stopper Sue! Love all the pretty papers and that addition of blue is eye catching!